AWS Fargate is a compute engine for Amazon ECS that allows you to run containers without having to manage servers or clusters. With AWS Fargate, you no longer have to provision, configure, and scale clusters of virtual machines to run containers. This removes the need to choose server types, decide when to scale your clusters, or optimize cluster packing. AWS Fargate removes the need for you to interact with or think about servers or clusters. Fargate lets you focus on designing and building your applications instead of managing the infrastructure that runs them. Amazon ECS has two modes: Fargate launch type and EC2 launch type. With Fargate launch type, all you have to do is package your application in containers, specify the CPU and memory requirements, define networking and IAM policies, and launch the application. EC2 launch type allows you to have server-level, more granular control over the infrastructure that runs your container applications. With EC2 launch type, you can use Amazon ECS to manage a cluster of servers and schedule placement of containers on the servers. 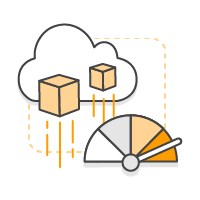 Amazon ECS keeps track of all the CPU, memory and other resources in your cluster, and also finds the best server for a container to run on based on your specified resource requirements. You are responsible for provisioning, patching, and scaling clusters of servers. You can decide which type of server to use, which applications and how many containers to run in a cluster to optimize utilization, and when you should add or remove servers from a cluster. EC2 launch type gives you more control of your server clusters and provides a broader range of customization options, which might be required to support some specific applications or possible compliance and government requirements. This is an introductory course to AWS Fargate. In this course, we cover how Fargate makes it easier for you to run applications using containers and we walk through an example architecture of AWS Fargate so you can better understand how Fargate works. With AWS Fargate, you only have to think about the containers so you can just focus on building and operating your application. AWS Fargate eliminates the need to manage a cluster of Amazon EC2 instances. You no longer have to pick the instance types, manage cluster scheduling, or optimize cluster utilization. All of this goes away with Fargate. AWS Fargate makes it easy to scale your applications. You no longer have to worry about provisioning enough compute resources for your container applications. After you define your application requirements (e.g., CPU, memory, etc. ), AWS Fargate manages all the scaling and infrastructure needed to run your containers in a highly-available manner. You no longer have to decide when to scale your clusters or pack them for optimal utilization. With Fargate, you can launch tens or tens of thousands of containers in seconds and easily scale to run your most mission-critical applications. AWS Fargate seamlessly integrates with Amazon ECS. You just define your application as you do for Amazon ECS. You package your application into task definitions, specify the CPU and memory needed, define the networking and IAM policies that each container needs, and upload everything to Amazon ECS. After everything is setup, AWS Fargate launches and manages your containers for you. AWS Fargate Platform Version 1.3.0 is now available. This update adds Secrets support when using Fargate launch type with Amazon Elastic Container Service (ECS). See how you can easily migrate containers from running on Amazon EC2 to AWS Fargate. Despite offloading management of the underlying compute instances, Fargate still gives you deep control over configuration of network placement and policies.